A great choice for UAD enthusiasts who need plenty of processing at the production and mix stages. Compact design and minimal operational noise. Run masses of UAD plug-ins at once. Daisy-chain to other Thunderbolt devices. UAD is known for the vast array of emulations it has produced of some of the world's most famous analogue hardware, including plug-ins which model the sound of Neve, Manley, Fairchild, Moog, Pultec, Studer, Lexicon, and many others. Alongside Waves, UAD has done much to make DAW production and mixing a viable solution for professionals the world over. However, UAD's approach doesn't only involve its software; the ace up its sleeve is that it also provides the hardware on which its plug-ins are hosted. The advantage here has always been that its plug-ins don't tax your computer's CPU. "With its fan-free near-silent operation and compact frame, the Satellite is a viable choice for producers wanting to take their UAD plug-ins with them as they travel"
However, as UAD's emulations become more detailed, the software is increasingly taxing UAD's own processing hardware, with some of its most recent releases allowing for only a handful of instances to be run before its cards reach full capacity. Two new releases are set to quench the thirst of UAD users who crave additional processing power. The first is the launch of Apollo Expanded. Apollo is UAD's hardware range which provides high-quality preamps and audio interfacing alongside software hosting, and, at present, there are three products in the range: the desktop Apollo Twin and two rackmount units, Apollo and Apollo 16. Apollo Expanded will allow producers to chain multiple Apollo products together, to aggregate their recording I/O and to distribute plug-in processing across multiple devices at once, all via Thunderbolt connections. Apollo's remit has always been to allow for UAD plug-ins to be accessible at the recording stage whilst tracking, as well as at the output stage, when mixing. However, what if you only need UAD plug-ins once you're producing and mixing? Maybe you've already got a great-sounding interface and you just want lots of processing power to run UAD software. 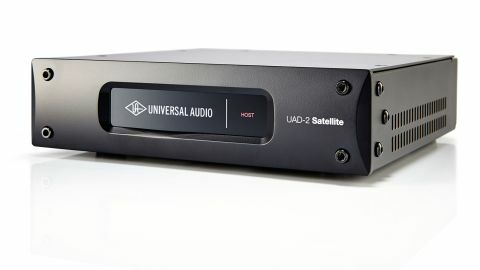 If that sounds like you, the second release should be of interest - the revised UAD-2 Satellite, which is now available with two specifications. The new Satellite is a neat and tidy black box which offers little more than masses of UAD processing power. Along its front surface, a Universal Audio logo illuminates when the unit is powered up, whilst a Host light glows when the unit is connected to a computer (or flashes red if that connection isn't properly made). Round the back, you'll find the power connector and two Thunderbolt ports, the second of which can be used to daisy-chain to other devices. And, as far as the outside of the unit goes, that's your lot. Fortunately, there's a good deal more happening inside. Satellite is available in Quad and Octo forms, with the units offering four or eight SHARC processors respectively. These are solely focused on crunching the numbers to deliver UAD's plug-in collection with, as you might expect, the Octo version delivering twice the processing power of the Quad equivalent. Of course, you're able to populate your UAD system with any plug-ins from a collection of over 90 titles but a purchase of a Satellite system comes with the Analog Classics Plus bundle, which offers Legacy editions of classic Universal Audio, Pultec and Fairchild emulations. With its fan-free near-silent operation and compact frame, the Satellite is a viable choice for producers wanting to take their UAD plug-ins with them as they travel to write, produce and mix and, unless you need to have access to your plug-in suite at the tracking stage, it's the best value for money way to get a whole lot of UAD processing power bang for your buck. In combination with the Apollo interfaces, it's also the perfect partner - a Twin for a couple of high-quality preamps, plus a Satellite for truckloads of effects power. Mouth-watering, to say the least.